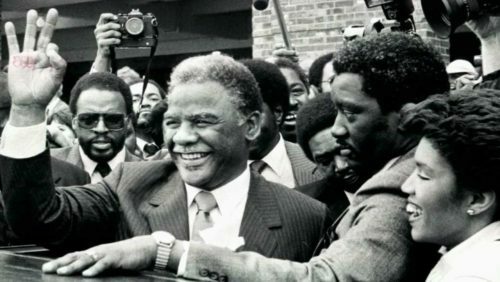 Harold Washington (1922-87) was historic as Chicago’s first black mayor. But he was also historic on how he led the city to expand support and outreach to LGBTQ Chicagoans. With a coalition of support, Washington, was elected mayor in 1983 and again in 1987, just before his death. “Business as usual will not be accepted by any part of this city,” Washington said, and among his many initiatives, he promoted LGBTQ political involvement. He was the first mayor to headline a gay-rights rally, and he established the city’s first office on gay and lesbian issues. As a law student at Northwestern University, he was the only black student in his class. After private practice and government jobs, he served in both Illinois House and Senate. Even before becoming mayor, he fought for the inclusion of LGBTQ people in the state’s Democratic Party platform. Advancements in LGBTQ rights in Chicago relied on an alliance with the African Americans. In 1984, Mayor Washington headlined a Lincoln Park rally in support of a sexual-orientation nondiscrimination ordinance. In doing so, he advanced a campaign that had begun in 1973. The ordinance passed in December 1988, a year after his death early in his second term. Washington married at age 19 and divorced after law school. He did not identify himself as gay, but the Chicago LGBT Hall of Fame recognizes Washington for promoting and facilitating LGBTQ political participation and empowerment.